We got up just before 07:00 and had showers before descending to the breakfast room. We had cereal and cornetti, and I tried making a toasted cheese roll in the sandwich press, but it wasn't very hot and the cheese didn't melt at all. Before leaving La Spezia, we walked back to the bakery where we'd had lunch yesterday, to buy some things to take with us for lunch during today's drive. We asked what the brown focaccia-like bread was that yesterday the lady seemed to be saying was filled with cherries. After some to and fro with language, we determined she meant cereals, that it had different grains in it. M. got a slice of that, while I chose a slice of one that looked like it had cheese with lumps of feta on it, and the woman said "Gorgonzola" as she cut a piece for me. Taking these back to the hotel, we repacked our bags to fit all our new things and our freshly cleaned laundry in, then checked out and headed off in the car. Navigating out of La Spezia was not too difficult, and we picked up the autostrada north of the city, where we'd got off it the other day when we'd arrived. We took the route towards Genova, west along the coast. The road was good, passing over many viaducts and through lots of tunnels as it cut through the rugged coastal landscape of hills and steep valleys. We saw the Mediterranean Sea a few times but never got really close to it. After an hour or so of driving, we passed Genova, skirting around the edge of it. This was a tricky bit of navigation, as there were several exits and forks and they all had place names we didn't know. M. used Google Maps to assist and we managed to pick the correct forks, which followed signs pointing to Ventimiglia. (I checked where Ventimiglia is later, and this was certainly the right direction, as it's the last large Italian town on the coast before the French border.) However we didn't follow the coastal road all the way, but instead turned inland at Savona, heading towards Turin. We drove on into the heart of Cuneo, which sits on a shallow plateau between the confluence of two rivers, which flow in valleys below. 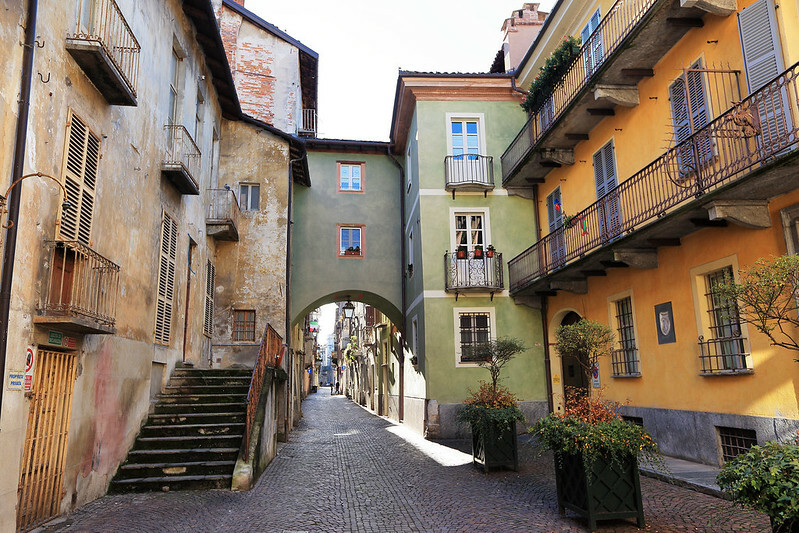 The entrance to Cuneo was across an old stone bridge from the north. Once into the town, we saw a sign for parking and found a free spot, so we parked and went for a walk to find a hotel. 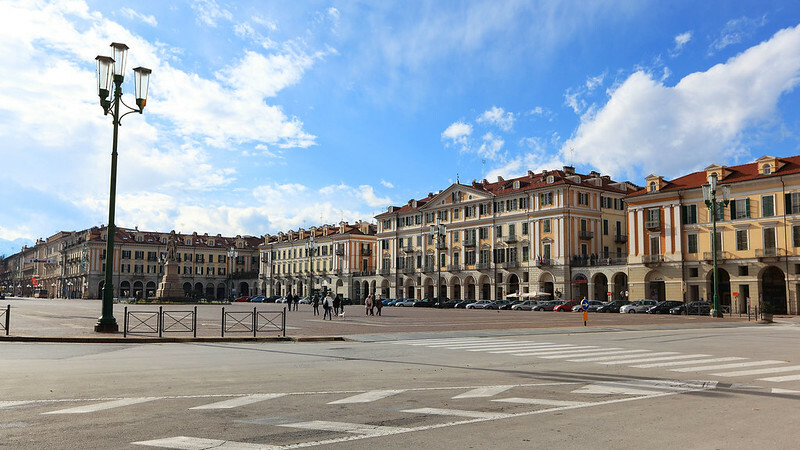 We were just a couple of blocks from the main piazza, a large empty square with a tall monumental statue of a man in the middle, facing east down the main street through the old town area. On this piazza was the Best Western Hotel Principe, which looked good and convenient for exploring. Before going there, we walked a little way up the main street to the west, through the new town area, past various shops. The street was lined with colonnaded buildings, so all this was walking under cover, though the weather here was fine and sunny. Returning to the square, we passed several pasticcerie, all selling chocolates similar to the limoncello ones we'd bought in Como. They were all advertised with the name "Cuneesi al rhum". One shop in particular was decorated with many of these chocolates and had a very antique but well maintained look, and there was a photo of Ernest Hemingway in the window, apparently when he visited the shop many years ago. Looking up information about Cuneo later in our hotel room, we discovered that Cuneesi al rhum were invented in Cuneo, by the original proprietor of that exact shop, Arione, and that these chocolates are the main gastronomic specialty of Cuneo! It finally clicked that "Cuneesi" is formed from the word "Cuneo". Monkey found some interesting Cuneesi al rhum! Reaching the hotel, we inquired about a room and secured one for the night. The man at reception asked if we had a car, and I said we'd parked a few blocks away. He said go get the car and park right out the front, showing us a spot reserved for guests unloading luggage, and he'd check us in when we got back. So we did so, walking back to the car and driving it over. Fortunately the route was obvious and easy from where we'd parked earlier. The man asked us to leave him the car key and he'd take care of it for us. I assumed he meant that he'd copy the registration details onto the hotel paperwork. A lady, perhaps the guy's wife, took our passports to fill out the room booking while the man helpfully pulled our luggage over to the lift and then up to our room. He chatted with us as we went, and told us what channels had English programs on the TV, and was generally friendly. After we'd settled in we went down and picked up our passports. The man gave us two maps of the town, showing us where all the sights to see were, and then on the second map marking out the locations of several nearby restaurants. He advised us that being Sunday, some of them would be closed, but at least some would be open. He mentioned several places by name, and checked with the woman, asking if a certain restaurant was open tonight, while she looked through a collection of business cards and read out various things like, "closed on Wednesdays". During all of this, a small dog was hanging around, obviously owned by one or both of them, and sniffing us interestedly. We went out for a walk to see the old town area. 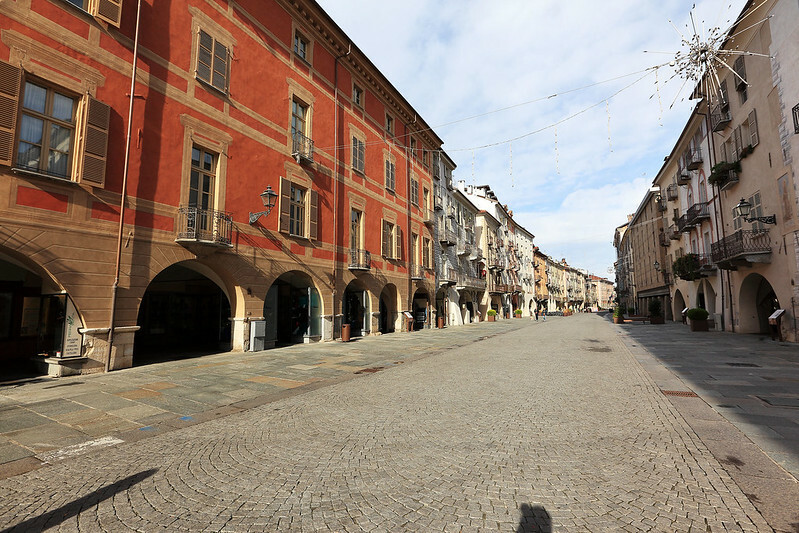 The streets were fairly deserted, it being the afternoon siesta time by now. We passed the main cathedral and several churches, none of them open, and most of the shops were closed too. We walked the length of Via Roma, through the heart of the old town, and took some of the side streets to see things hidden down those. Via Roma is a slightly wobbly street running east from the main piazza, turned into a pedestrian mall, with rows of colonnaded buildings running along it. The buildings were generally shops at street level, with residences above. The street had been renovated and restored apparently recently, as all the buildings looked in good condition despite their age, and there were informational plaques in front of many of them, showing before and after photos of the restoration work. After wandering up the length of the street and partway back we stopped in at a cafe bar called Bar Bruno to sit and have a drink, letting me write some diary while we waited until 15:00 when some of the shops would reopen. It was busy, but they had several tables free, so we sat in a corner where we could both sit on the bench and look into the cafe. A table near us held a family group who were finishing off lunch, and a bit later a waiter brought out a birthday cake, apparently for the older lady in the group. M. ordered a latte macchiato, while I ordered a cioccolata calda. She said she hoped it was a small drink, but it arrived in a tall glass with a cup handle. With the coffee names and styles being different here, she didn't know how to get a small cafe latte. We also got some fizzy water to help wash down our drinks. As we sat, we noticed most of the men in the cafe, as well as some out in the street looking in through the window, were paying attention to a TV screen above our table. When I looked, of course it was a soccer match being played there. It was interesting seeing the family table group split into women chatting with each other and men all looking silently at the TV. We stayed until a bit after 15:00, when we noticed the empty street outside start to fill with the buzz of people, emerging after siesta for the afternoon trading hours. Then we left to walk back up the main street. 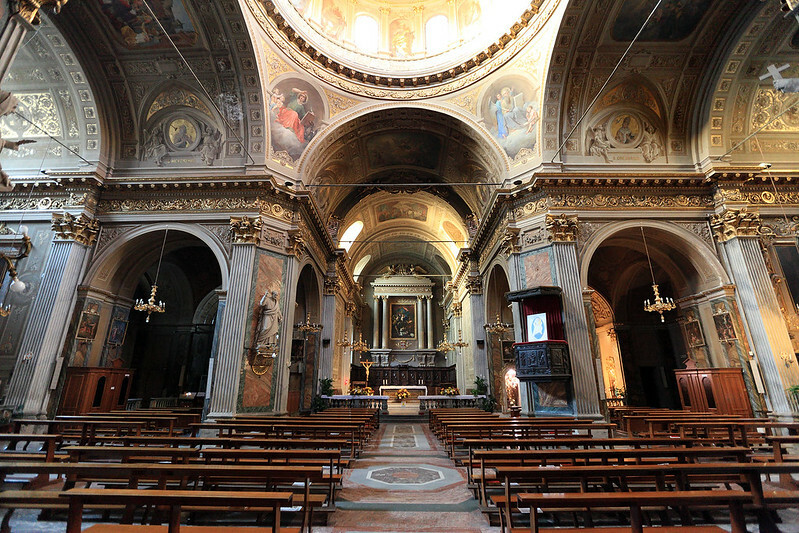 The duomo, or Cattedrale di Santa Maria del Bosco, was open now, and we went in to have a look. It was large and interestingly decorated, with many paintings on the walls and ceiling, and some interesting sculptures, but quite dim and dark, so hard to take good photos. 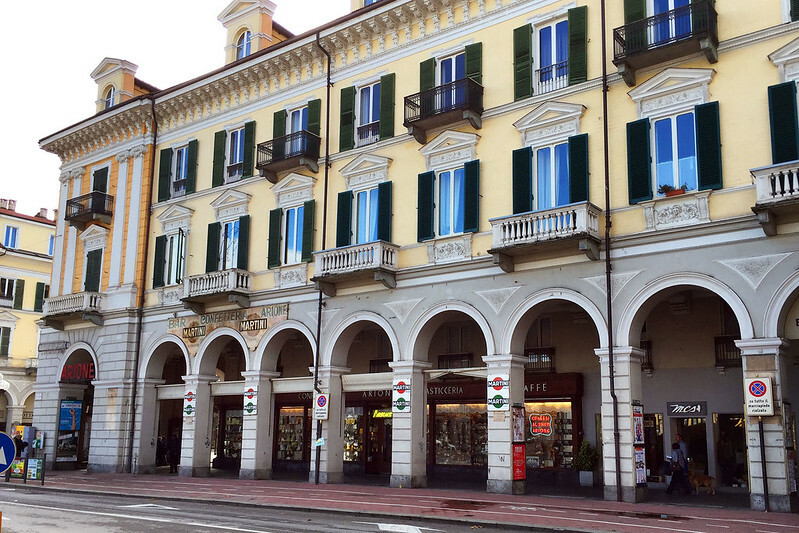 We also checked out the Arione shop, although we still hadn't discovered its historical significance at this point. 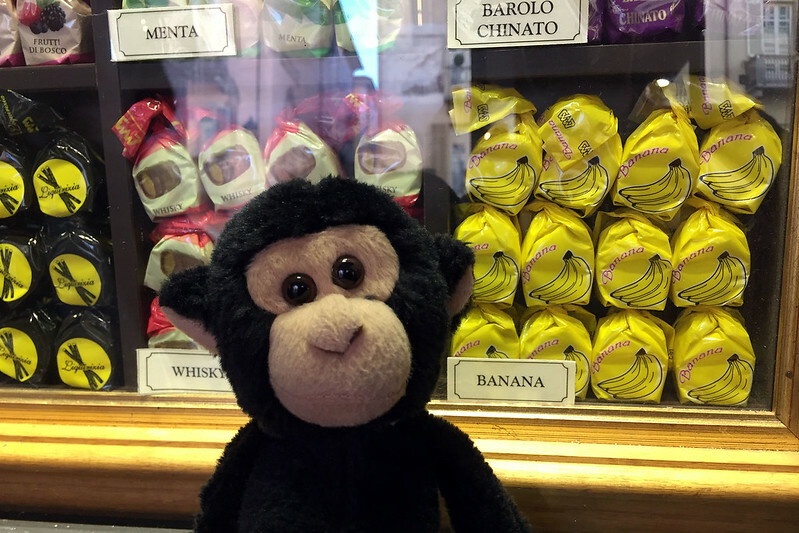 Besides the chocolates, they also sold dozens of types of Italian biscuits, and M. wanted to buy a gift tin of them to take home for her family. She'd seen the gift tins in the window when we'd walked past earlier. But the inside of the shop was crowded chaos, with lots of people bustling around buying things and others sitting at cafe tables having drinks. There was only a big display of all the available biscuits loose, and no gift boxes. I went back outside and had a closer look and realised they weren't prepackaged gift tins - they were cardboard boxes, which you could have filled with your choice of assorted biscuits. M. wanted a metal tin for safety of transport so the biscuits wouldn't get crushed, so decided against getting a cardboard box full. From here we walked south to where we could see the edge of the plateau on which the old town sits. There was a view over the valley below and across to a range of snowy mountains, presumably part of the Alps. The spot where we stopped to take in the view was the top station of a funicular which ran down the hillside to a swimming pool and other facilities at the base of the plateau. Back at the hotel we rested for a bit until dinner time. The check in man had said that restaurants opened at 19:30, so we emerged around then to walk down the old town and check out the open restaurants he'd suggested. The first place was Via Santa Maria, which he said had about eight or nine restaurants, most of which should be open tonight. We passed a few, looking inside and at the mens posted outside. One was essentially a meat restaurant, and another called La Mucca Pazza ("the mad cow") also featured meat heavily. But then we found Osteria Senza Fretta, which had a very interesting sounding menu featuring local produce, including hazelnuts and chestnuts in many dishes. They had a risotto with red chicory, Piedmont hazelnuts, and local Castelmagno mountain cheese, which M. liked the sound of. We went in and asked if we could get a table, and a waitress showed us to one in a smallish room with only six tables. The menu was written in Italian and English. When I mentioned that M. was vegetarian to make sure the risotto was suitable, the waitress also indicated that they could make two of the appetisers (none of which were vegetarian as listed on the menu) without meat as well. But M. decided to just have the risotto as she didn't want to continue the trend of eating more than usual on this trip. 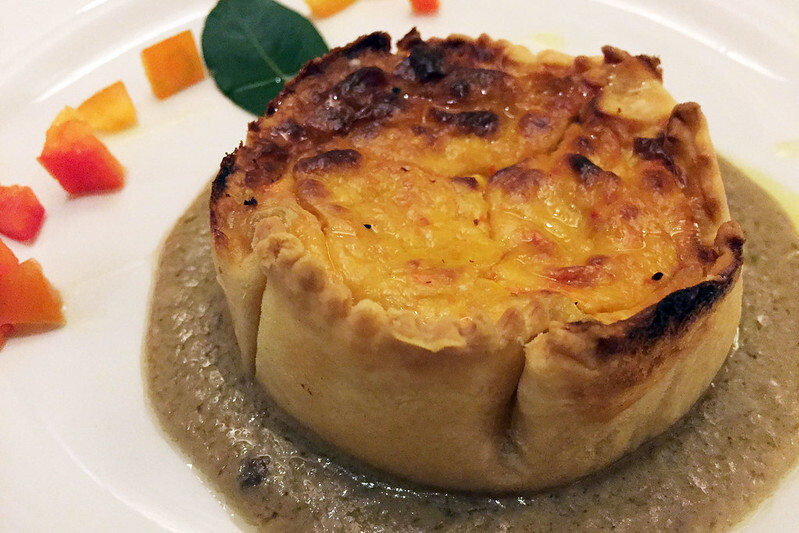 I chose a pepper tart served with "bagna cauda", a sauce of garlic, anchovies, and milk for an appetiser, followed by veal with roasted Piedmont hazelnuts. We asked what wine would go with the risotto, and the waitress recommended a Nebbiolo, picking one for us from about a dozen different Nebbiolo options, and we ordered a glass each. First we were served a basket of bread: small slices of white and brown breads, and a bundle of crispy grissini. The grissini were obviously hand made and really delicious, papery thin crispy layers with air pockets making up the traditional long thin shape. The wine came in a sealed bottle, which the waitress attached a gadget to that trickled wine out through the cork as she pumped a lever, and then she removed the gadget and the bottle still looked sealed with the original cork and wrapping. My tart and M.'s risotto came in quick succession, and I finished the tart so they could serve my main course while M. was still eating. 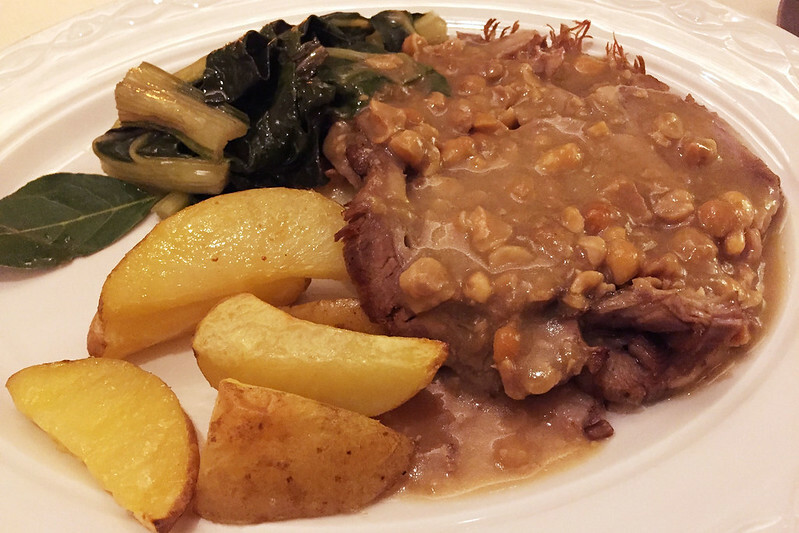 The veal was three thin slices stacked and smothered in the hazelnut sauce, and had small roast potato pieces and some spinach on the side. Everything was amazing and delicious, with very different flavours and multiple textures, especially the crunch of the hazelnuts in both M.'s risotto and my veal sauce. The owner of the place came out and chatted to us briefly a few times during the dinner. He was a large, rotund man with a beard and glasses. He reminded both me and M. of the detective in the British show Pie in the Sky (played by Richard Griffiths, who played Vernon Dursley in the Harry Potter movies). 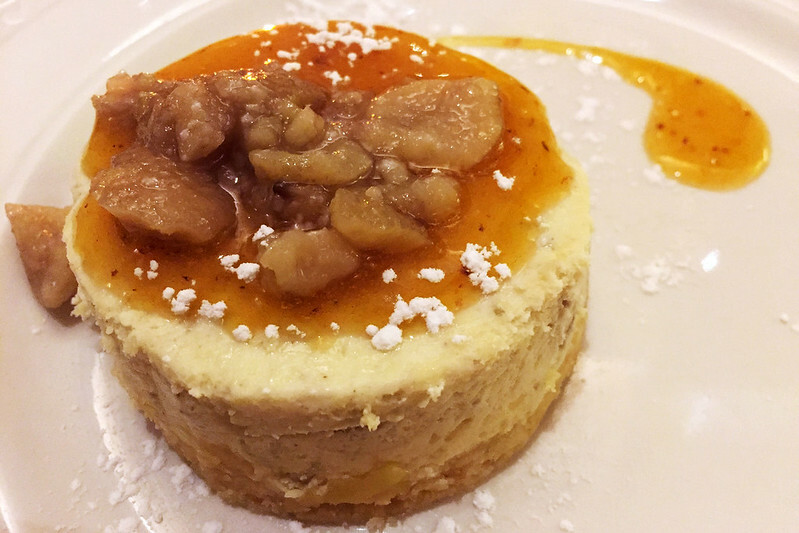 For dessert I had to try the intriguing sounding chestnut cheesecake with persimmon sauce. This was a round individual serve rather than a slice of a larger cake. It had chestnuts in it, and a sauce on top with honey with small chestnut pieces in it. Again, absolutely delicious and unusual. After this amazing dinner, we walked back to our hotel and turned in for the night. Last updated: Monday, 22 May, 2017; 04:23:07 PDT.